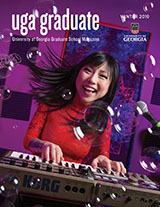 Many degree programs within the University of Georgia offer awards to students seeking a major within their department. Information regarding these departmental awards may be found by visiting the departmental websites. The following awards are offered through the Graduate School. This award recognizes outstanding research by graduate students. Five awards of $1,000 are given annually, one from each of the following five areas: Fine Arts & Humanities, Social Sciences, Life Sciences, Mathematics and Physical Sciences, and Professional and Applied Studies. Students who graduate in the calendar year prior to the award being presented at the Annual Research Award banquet in the spring are eligible. Students are nominated by their departments and recipients are selected by a faculty committee. View previous recipients. The University recognizes the significant contribution graduate students make to the instructional mission of the University with two separate awards: The Outstanding Teaching Assistant Award, sponsored by the Office of the Senior Vice President for Academic Affairs and Provost; and the Excellence in Teaching Award, sponsored by the Graduate School. Nominees for either award must have fulfilled TA Policy, have taught at least once within the last two terms, and be enrolled full-time in the semester of application. For more information, visit the Center for Teaching & Learning. View previous recipients. This award recognizes excellence in a variety of mentoring functions. This award encourages and rewards innovation and effectiveness in mentoring graduate students by faculty during their educational experience. Two awards are given each year to current members of the Graduate Faculty. Awards in Professional/Applied Sciences and Social/Behavioral Sciences are given even years. Awards in Humanities/Fine & Applied Arts and Life/Physical Sciences are given in odd years. Each award is for $500. View previous recipients.